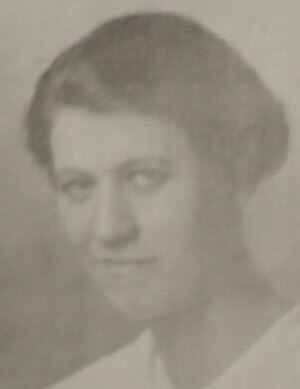 Nettie Birdsall, a 26-year-old from Clare, Mich., went to Sierra Leone in December 1920 as a teacher and served two terms, up through November 22, 1926. After concluding her United Brethren work in Sierra Leone, Nettie spent five years with a Protestant French faith mission in French Equatorial Africa (what are today the countries of Chad, the Central African Republic, Cameroon, the Congo, and Gabon). Then she served seven years in the Belgian Congo. After those lengthy assignments, Nettie returned to the States. In 1948, she once again applied with the United Brethren mission board. They sent her to Sierra Leone in January 1949 for a third term, where she served at the Minnie Mull Home. However, a stubborn illness cut her term to 11 months, and she returned to the States in December 1949. In July 1966, Nettie married John Swales of Lamont, Iowa. They had been students together, 1915-1918, while attending Huntington College. Nettie passed away February 3, 1970, and John died two years later.